It’s a great time to start podcasting. It’s never been easier to record, publish, and distribute a podcast that everyone can hear. But the part that can be the trickiest is just getting started, and having an idea of what your podcast actually is. We’re here to help! So we’re launching a new weekly podcast about launching your new podcast. We’ll explore how to start your show and make it into something your listeners will love. Over the course of the show, we’ll move all the way from ideation, through recording and editing, to distributing your show. I Should Start A Podcast is hosted by John Lagomarsino, Anchor’s head of production. He’ll talk to other podcasters about their process, explore how to get your idea off the ground, and how to get that idea into strangers’ ears. 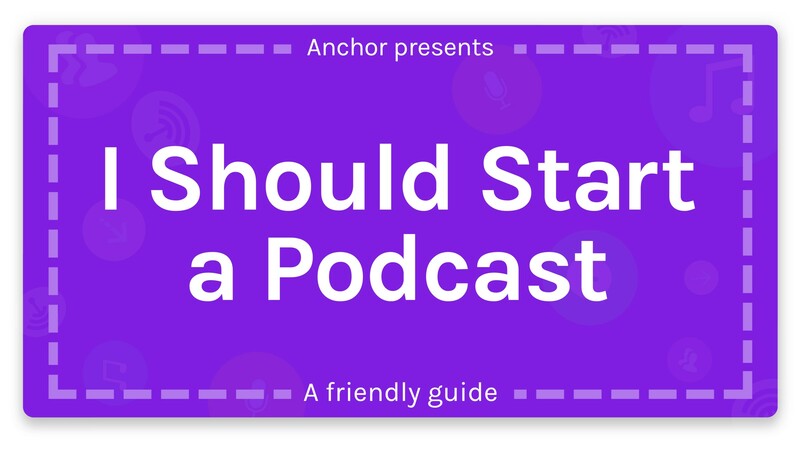 If you have burning questions about podcasting, leave John a voice message on Anchor, and your question could be on the show (and the answers, too)! Subscribe via Anchor, Apple Podcasts, Overcast, or Pocket Casts. We hope this show gives you everything you need to start creating. If you’re inspired to make something, record a trailer and title it ‘Coming Soon’ to submit to our weekly spotlight series, Coming Soon. Happy podcasting!